Yesterday I decided it was high time to cut into my Anna Maria Horner Good Folks before another year goes by and we’re all still looking at the Good Folks projects. Case in point: have you noticed alot of Mendocino around here lately? Yeah, I acquired that last August. 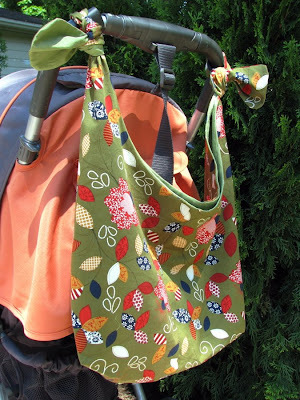 I didn’t want to think too hard about what to make so I pulled out my favorite quickie pattern, formerly known as the “stroller bag,” now known as Lickety Split, due to the fact that I can literally make one in 15 minutes (without the pockets) to 30 minutes (with pockets). Like the Oceana Tote, this one is reversible although it’s bigger and not interfaced so it’s super lightweight and folds up to almost nothing. I added some blue and red ric-rac to the pockets, for a little extra cute. I’m hesitant to say this but I think this is my Perfect Bag. It works for library books, farmers market, grocery store, just over the shoulder, and because it’s adjustable I can hang it on any stroller. It’s big enough for baby and toddler gear but my little sister Kricket carries hers around so I know it’s not too mommish (that or she just switches to it every time she comes over…sneaky). And it’s wide enough at the bottom for a carton of eggs. Eggs!!! I’d be happy to scan and sell this if anyone’s interested (no commitment of course). I think I want to try out some automatic download software for PDFs so that if someone bought it they could download it right away. This might be the one to start with, but if you guys think it’s a bad idea I’ll save myself the time. I’m able to turn around most pattern orders on Etsy within a few hours, but that’s still a wait, and for a PDF it would be nice to get it right away. wow!!! really great totes!! have a nice week! What a great bag! Looking at it, I realize that I've got a purse with an almost identical design…and I never thought to use it on a stroller! Brilliant. I think this pattern with definitely sell!! love it, would love to make it, would buy it!!!! I love these new bags and your fabric choices! 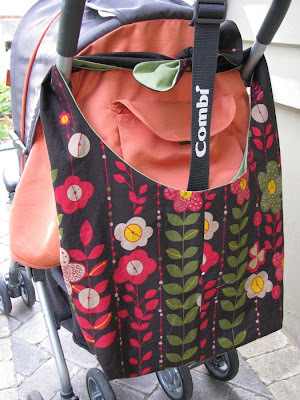 As you know I already have a stroller bag, but I think the pattern would defintely sell! I would love to buy this bag pattern if it was priced for my budget! Please sell it! I second the "I would buy it if it is within my budget" comment. Cute, versatile and quick… love it! yep, I'd be interested in the pattern for sure! so cute. I have that stroller! I loved it, (we now have 2 kids so the combi got demoted to the closet). So back to the bag. Looks great, I'd be interested in a pattern. Sewing is a lot like cooking, isn't it? Once you gain any degree of proficiency, it's hard not to think of how you might do it differently! I want it!! Please if you've the time and energy… It is perfect. And I need to use up some Good Folks, too. Your bags are gorgeous! I'd definitely be interested if you decide to sell the pattern. My sis had a bag like that this morning, and I was staring at it during the kids swim lessons thinking, "I need to make myself one of those for the summer." Love the stroller version–I'm done with stroller days, but my sis is headed back to them, so maybe I'll make her a larger one—pattern would be nice–cut out my guess work. I love it. I think it would sell, but I have a pattern I could modify to get a similar result. In fact, I think I'll look for it right now! Ps. I'm all about sewing and modifying patterns right now. I made a wrap skirt by modifying an existing pattern. I made a little A-line skirt without a pattern too. Both fit perfectly! Look at me go! oh please sell this pattern! I strongly desire to make this bag! I am a tote-aholic. thank you! These look great! I'm always looking for a bag similar to this one–I would buy the pattern. I love this bag! I would definitely purchase a pattern for it. I just purchased your toddler backpack pattern last week and am anxiously awaiting the arrival of some fabric I purchased online so I can make it for my daughter! I would love to have this pattern in this size. If a carton of eggs fits in the bottom, I'm in! What?! You mean you don't save your paint chips in your house binder?! I take SO.LONG to decide on paint colors, that once I do, I save them forever-and-ever in a 3-ring-binder dedicated to my house. Maybe that's just crazy me! I love to sew and have PILES of fabric, but I'm ashamed to admit I bought two bags very much like this from Old Navy last year. They were around $12, which was basically the cost of fabric, so, I figured I was okay. Cute bag! I am definitely interested in the pattern. Oh, I would love the pattern for this one… And I don't even have a stroller to attach it to!! You are my kind of gal – the faster the project the more I LOVE it. Okay, this happens to be adorable and a great size. Every bag I make, I always take the measurements and beef them up a bit because I find them to be too dainty. I guess I carry around too much stuff!! Would love a pattern for this if sold. Just wanted to put in a vote for this being a PDF file! I love PDF patterns, because then I never need to worry about misplacing it- there's always a saved copy. It's Simplicity 4670, "Sewing Patterns For Dummies". Personally, I'm convinced it should be "Sewing Patterns Written By Dummies" because the instructions made no sense whatsoever. The ties/strap part is shorter, but easily modified. I've had it for a while, I'd bet it's out of print. The construction is different enough that you aren't stepping on anyone's toes. i'd looooooooove the pattern. how much fabric did it use? love it! Last comment on this post, I swear. It's the 4th one down in the lefthand column. It's the polka dotted one. I would love this pattern! I'm obsessed with finding the perfect bag — and this may be the one! I would love to buy this pattern! I would definietely nuy the pdf !!! (sincerely, WHEN are you selling it ???) And Rae, I am not forgetting the translation. It is done but I am moving out from Angola and be in Europe next week, so I'll send it to you once there !!!! I would buy this pattern – I love the bag!!! 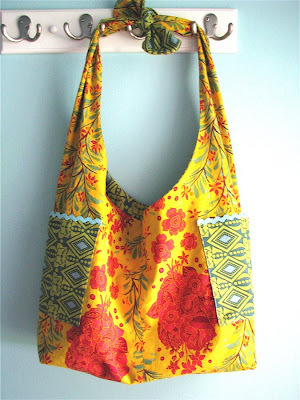 I would LOVE this pattern — it looks exactly like the bag pattern I've been searching for! seriously! i'm not switching, dork, i really do take it EVERYWHERE, and i get compliments on it all the time. i like it because i can put giant books in there. actually i was going to ask you to make me another one for my bday with black in the pattern, and a little pocket inside the size of business cards to keep mine from flying everywhere. I would totally buy that pattern. It looks like the perfect bag! Love it… I'm in if you offer it for sale! Love the shape/size, etc…. Such a great little bag and I love that it can strap onto a stroller. Super handy! Those bags are perfect! I would buy the pattern in a hot second. The bag looks great. You did a nice job and I would buy the pattern. I will buy the pattern as soon as you put it up! We've got lots o' babies coming this fall and the bag is perfect. I have the same Combi stroller and my one complaint was not enough storage – this would solve that issue! I'm still licking my wounds from a failed Birdie Sling…. I think I'll fall back on my favorite success; your buttercup bag. This bag you are showing seems like it might be within my beginning-sewer reach. I'd love to buy the pattern! Your other two send by PDF worked great, but I'd wait for snail mail too…..
Would love the pattern always looking for a great pattern! I really like this bag and would love to make it if you make the pattern available! I have made a couple of your itty bitty dresses (sorry I haven't ever said thanks and sent a picture!) and I think you do a great job. I've downloaded the buttercup bag, but just haven't had the time. This bag however, seems like I could make a lot faster than the buttercup and would serve my stroller/library/picnic/park stuff/in general all stuff kid lifestyle a little better! I would buy this pattern also. It looks super easy to sew up and with the right fabric……..oh the possibilities!! Why are we all such Bagaholics?! If it made any sense at all, I would likely have hundreds of them. i like how you can tie it on the stroller or hang it… very creative! Love this, I would definitely buy this pattern! Need a bag I can throw in the wash…..this would be perfect. If you do end up scanning this, I'm in on the purchase. Looks to me like it's a good one for versatility and I cannot get enough of that. 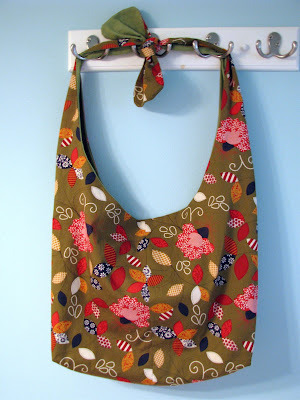 Love the fabric on all your totes! And what a lovely pattern! I am all for PDF patterns. It is awful waiting up to two weeks for something to arrive in the post. I would definitely purchase the pattern. Especially as I'll soon be pushing around one of those strollers and I love the fact that it can be tied different ways. Thanks for sharing. Keep us posted please! Love the bags! And, you're not whiny. 🙂 If we were all happy with the patterns out there, we'd just buy our bags premade. That's the joy of making them ourselves is that they are exactly what we need/love. Nice work, once again. I would buy the pattern- and in PDF would be great, too. I love that it can be tied onto the stroller. I just got a second-hand Joovy and it doesn't have a parent tray. This would be awesome to have. I'd just leave it tied all the time. I love this! I would buy the pattern! I love this pattern… I want to buy it NOW!! I would purchase the pattern- I'd like to try to make some bags- I've just been doing clothing so far- and this looks like a simple start. C'mon Rae… post the darn thing already 🙂 You know you want to make it cheap. 😛 I bought some fabric today, I forgot to get something different for the inside. 🙁 So I'm waiting!!! 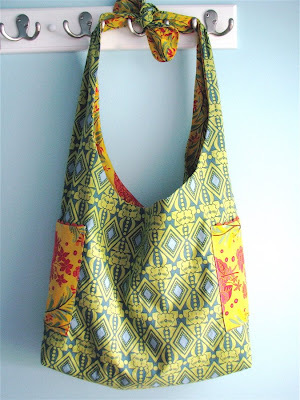 I love the bag, the fabric and the fact that its "your prefect bag"i would buy the pattern in a jiffy! Love your blog. I would definitely buy the pattern. I would love an cute library/farmers market/grocery/church bag. This is the exact bag my sister is asking for and I have yet to find a pattern. PLEASE post it — I have been looking for an excuse to buy your patterns anyway. this could be my perfect bad, too. would love love love to buy a pattern! I love the bag! I had a bag like this from the Gap years ago (a bit smaller, but the same concept), and I have always wanted to reproduce it. I would definitely purchase the pattern!! Love Love Love…great holiday gift idea..I WOULD BUY!! I would love to have this pattern!! I'm going on a trip in 2 weeks and this bag would be perfect as an undercover diaper bag for my kids. lol ok So I'm impatient I tried to wing it and make my own bag. Finished it today and the straps are shorter than I would like and the bag a little big. It'll still be good for a stroller bag but holding it on your shoulder hmmmm… well I guess I'll just wait for your PDF. I would love the pattern for this bag! It's so cute! I love this bag and would of course pay for the pattern! A stroller bag that's big enough to carry our stuff – brilliant! I hope you make the pattern! Would love the purchase the pattern for this bag! would love the pattern- my sisters are all coming this week and what a fun project to do together! I would like to make this bag. Is it going to be at your etsy site soon? hi would love to know more about getting the pattern. how much? 🙂 so cute. Love the tote! Would LOVE the pattern! This is the first pattern I have ever bought online/sight unseen. A big step for me!! 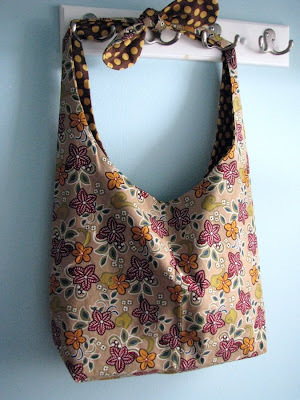 I love this bag and the pattern is very simple and easy to follow. Thanks for the great pattern!! I have to sadly admit—I am NOT a pattern gal…I am what you call a "free hand sewing girl"–that usually works out great–but puts limitations on what I can do. Then I came across this cute bag of yours that I was determined to buy & try. I have tried other patterns for a variety of things & have not had much success w/them. Your pattern was so easy to follow!! I especially loved the "cheat sheet" & pic's…for us visual peeps!!! Yea!! Thank you, thank you & thanks again!!! Definitely post the pattern. I love this design! Linda: I can't get ahold of you via your comment, can you email me off-blog and we'll see if we can fix your problem? I've made two bags now but I think I have to hem the edges because the fabric keeps fraying. What's your suggestion for a fabric that won't fray? Thanks!